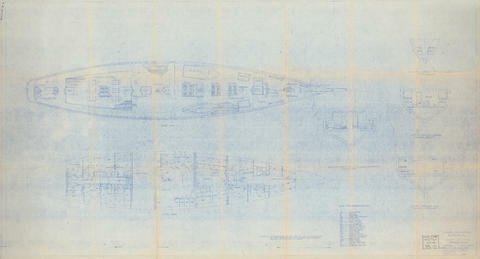 File contains two copies of a drawing of the general arrangement of the Bluenose II. The drawing includes a drawing of the lower deck; a drawing of the main deck; a section through aft accommodation looking aft; a section through crews accommodation looking forward; a section through the lounge looking forward; and a section through the hold looking forward. The drawing was produced by R. O'Brien for the Halifax Shipyards Drawing Office. Both copies of the drawing have a stamp of approval from the the Halifax Shipyards Drawing Office.